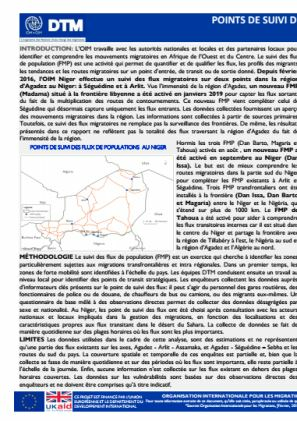 In Niger, Flow Monitoring Points (FMPs) are active at several important transit points in Arlit, Séguédine/Madama, Magaria, Dan Issa, Dan Borto, and Tahoua. In January 2019, the average daily number of individuals observed at the Flow Monitoring Points is 2,112; which represent an increase of 38% compared to the previous month. 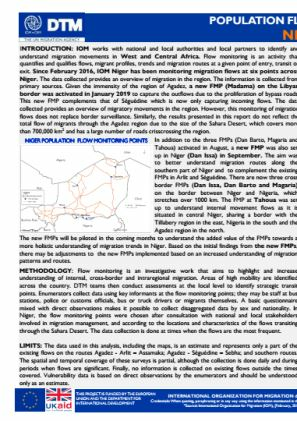 Nationals from Niger, Nigeria, Chad, Sudan and Mali accounted for 97% of all the migrants recorded at the flow monitoring points. 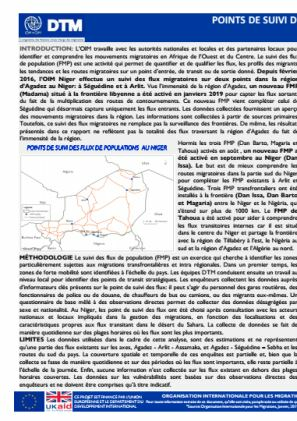 Nigeria, Algeria and Libya are major transit countries for migrants after their stopover in Niger. Economic migration, including but not limited to long-term migration of more than six months (43% of flows), short term movement (33% of flows), and seasonal migration of less than six months were the main observed types of movements.